Signs have gone up in the area around the Hyatt and Pan Pacific Hotels in Perth as it gears up for the CHOGM meeting in which the Queen will be paying a royal visit. WA Police have taken pre-emptive steps to discourage protesters from claiming they were not warned about the special police powers that have been granted them for the Commonwealth Heads of Government Meeting. Signs like the ones below leave no doubt that necessary measures will be taken to secure the areas where dignitaries will be staying and moving around. 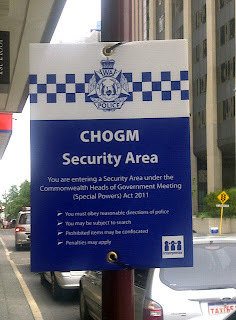 CHOGM goes from 28th-30th October, and Perth's Queens Birthday holiday has been moved to coincide with the massive disruptions caused by the CBD lockdown for the event. Road closures for the event have been listed here.